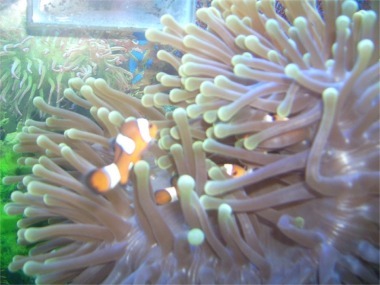 The clownfish has made many adaptations in order to survive better in its habitat. First, this particular species has more rounded caudal fins than other anemonefish, making it a naturally slow, less effective swimmer. These fins, however, enable the fish to make quick darting movements. In order to avoid predators by hiding within their host anemone, Amphiprion ocellaris have become resistant over time to the stings of the anemones in which they live. This resistance is enabled by a mucus produced by the clownfish, which coats the body. As a result of this adaptation, the slow swimming fish is given a place to live and hide from predators. One drawback from this adaptation, however, is that it is not permanent. 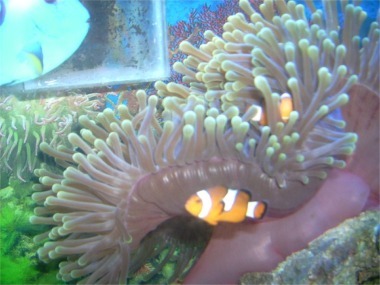 If the fish is absent from the anemone for a long period of time, an acclimation period must occur before the fish can reenter the anemone unharmed. Therefore, the adaptation is only good while the fish is in close contact with its host. Another adaptation developed by the Amphiprion ocellaris is its ability to detect the correct host species by olfactory stimuli. This particular species possesses an innate predisposition for the correct scent of its host and, as a result, is drawn to that particular host. This is considered an imprinting characteristic, in that, just after birth, the anemonefish is subjected to the host anemone's scent for only a short period of time, but the fish posses the memory to store the scent and be able to recall it later in life. (See also Reproduction). It is also under investigation whether or not the anemonefish can recognize its host species based on sight. This particular anemonfish species is successful in keeping its population high because it does not require obvious nesting sites when looking for a host. Its main goal in finding a host is to find one that will offer good protection from predators. Amphiprion ocellaris have the ability to nest on just about anything near their host, thus they are able to live in host anemones that may not have definite nesting sites. For more information about nesting sites, see Reproduction. Another adaptation that protects this species from predators is its ability to bleach itself in color at night and hide within the anemone tentacles. This bleaching camouflages the fish, enabling it to avoid any potential night predators. All of these adaptations have given Amphiprion ocellaris a better chance of surviving in nature than most other anemonefish.